The error is that I didnt implemented the abstract method: touchDown, but I dont implement and touch input atm. A bug of slick-ae? it's to implement or just @override it ? @Override means that the method is overwritten. For example, keyDown() is guaranteed to be called for each touch event, and when you override keyDown() in your game, you can decide what happens when a touch occurs. Concerning your exception, yes, that is a bug. Another one of your posts indicates you have already figured this out, but the source on the main slick webpage is out of date. For most of slick, the older version of the code will work, but for Slick-AE, the old version has bugs. One of them is that it doesn't use LibGDX Methods properly. The new version can be found at https://bitbucket.org/kevglass/slick/downloads. As I said before, your other post indicates you already know all of this, but for others who may not have seen, I repeat it. Also, I will update the link in this post. Thankyou for bringing this to attention. But what is the pointer/button? And how can I do this if I dont know where x and y is? I also didnt found any examples for touch screen inputs. Is there an interface for touchDown, touchUp.. like KeyListener/MouseLisener? I'm not sure. Slick-AE is actually designed to use MouseDown for android touches. This does not have a button element. Note that this and similar methods can be used for multi-touch. Honestly, I am confused. I am still trying to get it running on the computer first (I used normal slick before and want to "port" it to the gdxcontainer). I don't need more libs than those provided in the slick-ae project? Do you have a Java project for your game, and a separate Android project to run the game? Make sure you have all the libraries in a folder called libs (armeabi folder, armeabi-v7a folder, gdx-backend-android.jar, gdx.jar, slick-ae.jar) in your Android project. These don't need to be included in your build path if you have ADT 17 installed, but do if you have a previous version. 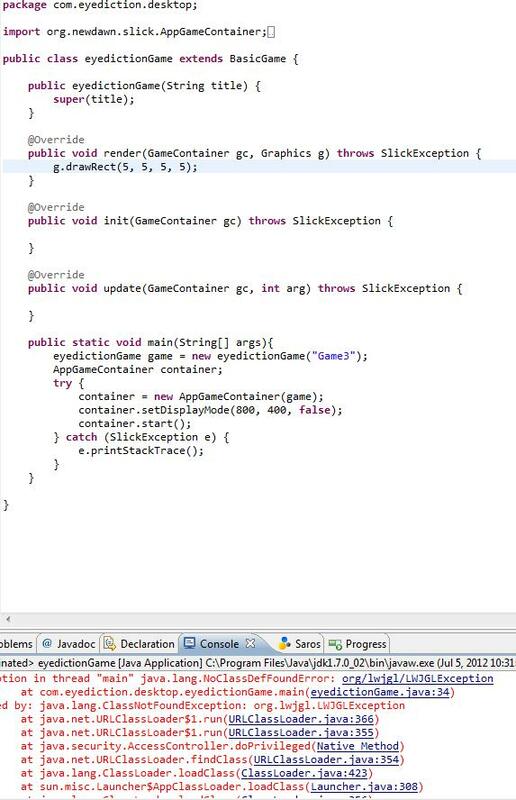 I *think* I did it correctly but am getting a random nullpointer exception when looking at the SlickAEDemo-Android. Location of error is also unknown, it just won't let me build it because "there's an error, go fix it". My actual project also has an error, namely "Conversion to Dalvik format failed with error 1". I'd love to work with this. Can you post the errors here? I have a feeling I know what the issue is but I need to refresh myself with what's going on. I *think* I read somewhere that you can include the assets folder of the Android Project in the Desktop project, but I can't find where that was. How would I do such a thing? EDIT: Never mind, I just did such a thing by adding the assets folder to the "source folders" in the Desktop version's properties.